Alright, back to danmaku game release, Touhou 11 is the eleventh release of the series. Still having several similarities of the game mechanics to touhou 10, it also introduces several new stuff in it. The story starts when there is a geyser appeared at Gensokyo. Not only that, there are also spirits that come out of the geyser which causes people to feel worry about the situation. 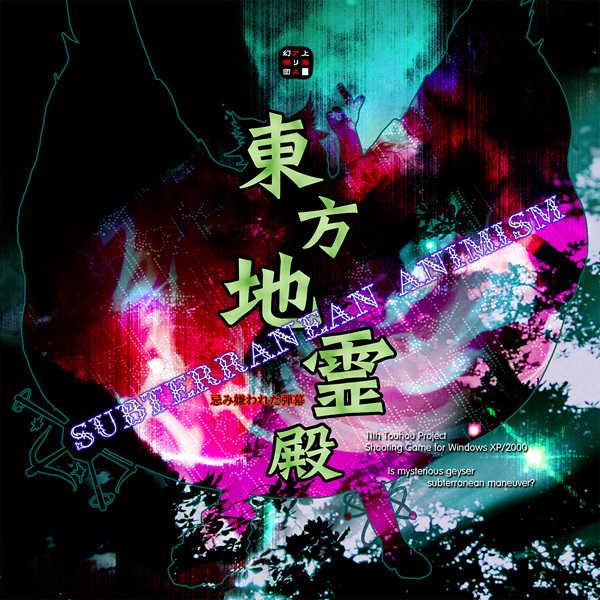 With the aid of some youkai who are Yukari, Suika, Aya, Patchouli, Nitori and Alice, Reimu and Marisa decided to go to the underworld and see what causes the geyser and the spirits to appear. The mechanics of the game is somewhat similar to Touhou 10 but with some new feature. green pieces affects the maximum points a blue piece gives. Graze now no longer to avoid the decay of the points but to act as the multiplier of the blue pieve, depending on how much graze the player gets. The multiplier starts at 1.00x and every 100 graze will increase the multiplier by 0.01. Meaning that 1000 graze will have multiplier by 1.10x while 10000 graze will have multiplier by2.00x. Next is that the player can obtain life piece during the stages and also boss battle. Each life piece gives 1/5 of player,s life. Collecting 5 will give 1 UP fot the player. To obtain it. dot't die at a specific events such as boss spellcards, and boss's cooldown phase. There is however 1 point right before stage 4 boss battle that gives life piece as well. Stage 4 Gameplay. The boss (Komeiji Satori) will use different spellcards depending on who the player partners with and use that partner's spellcards on the player.Imagine a Phantasm tier spellcard (Yukari) being thrown back at you, as a stage 4 boss battle. Stage 6 Gameplay. 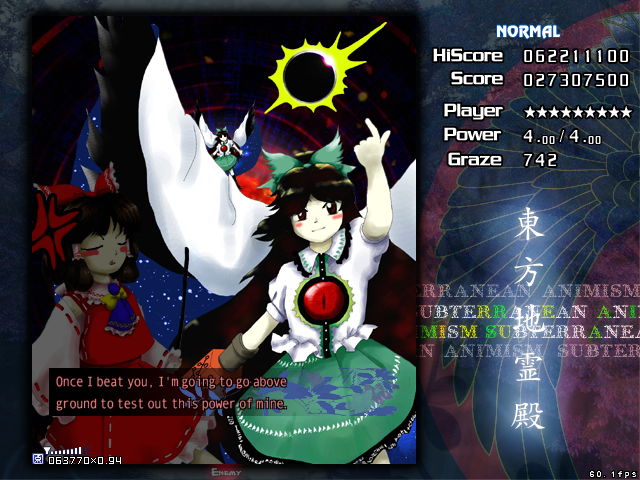 The boss (Reiuzi@Reiuji Utsuho) has rather unique declaration of spellcard with Nuclear warning signs on the screen. Nuke bird is OP with huge bullets and also can create artificial sun with gravity at the end of the video. 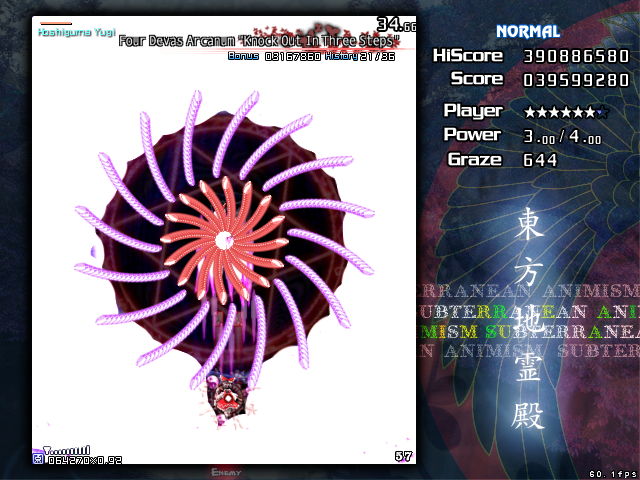 Extra stage Gameplay: In Forums of touhou fans, most people voted that this boss (Koishi Komeiji) is one of the hardest extra stage boss on the Windows platform. I find that this game is really great. 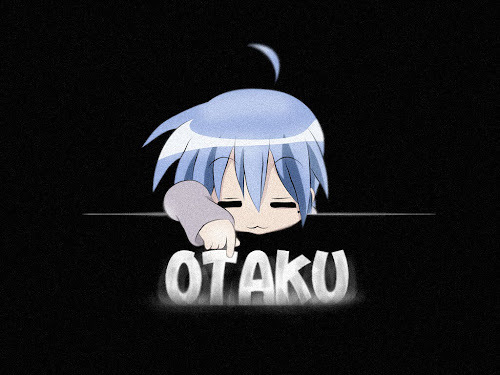 It also have one of the best OST in it. However, the game itself is relatively hard for casual player and to unlock the extra stage, the player will have to clear on normal difficulty. clearing on easy difficulty after unlocking the extra mode will somewhat RE-UNLOCK the extra stage so be careful. 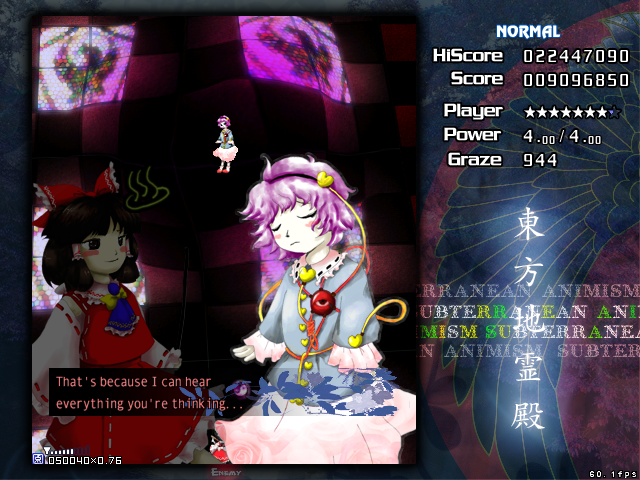 Touhou 12 will be about UFO so heads up. Bye!